The year started strongly for European markets with investors favoring Italian banks and stocks. But then came the budget proposal of the new Italian government, changing the mood abruptly. In January, the Stoxx 600, a broad index of European companies, reached its highest level since 2015. The same was true for European Banks (as measured by the Stoxx 600 Banks Index), which climbed almost 5% in the first month of the year. 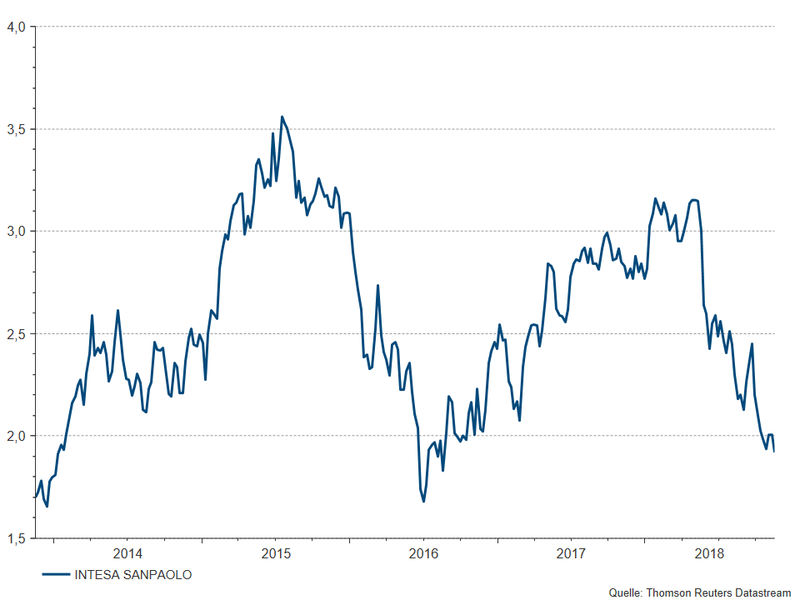 Italian Markets started out even better: the FTSEMIB-Index – which contains the 40 largest Italian companies – grew more than 7% in January and Italian Banks were among the best performing stocks, growing by more than 13%. After years of disappointing economic data, the Eurozone was able to surprise positively in 2017. Political sentiment in Europe improved considerably, after the market-friendly French candidate Macron was able to defeat the populist threat posed by Marine Le Pen. Sentiment towards Italy saw a sharp improvement also. Following the bailout of Banca Monte dei Paschi, it seemed like the worst period for Italian banks was over. Unicredit – the biggest Italian lender by assets – successfully reduced its high amount of non-performing loans (NPLs), helped by a capital injection. Intesa San Paolo – the other major Italian bank – purchased the Veneto banks, thereby helping sector consolidation. At the beginning of 2018, Italian banks seemed to be on the right track, offloading a large part of their bad loans to private equity firms specializing in buying distressed debt. 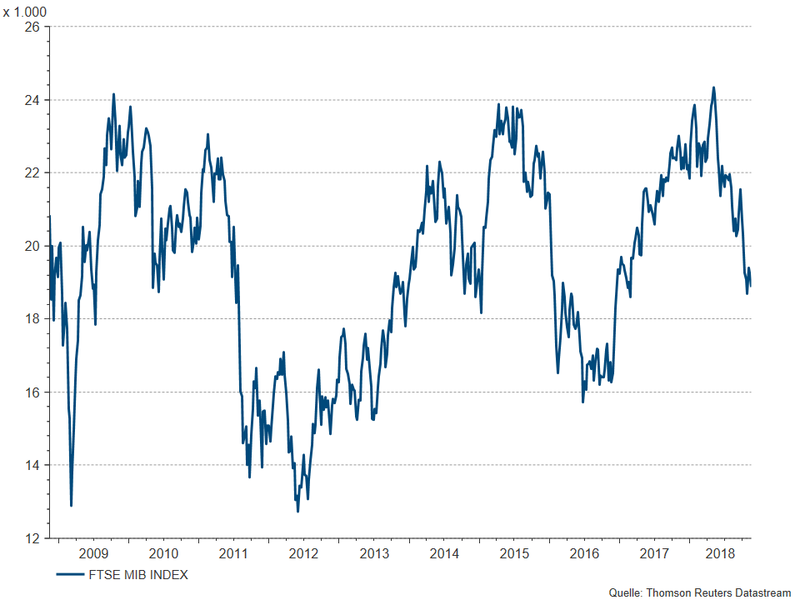 Investor´s excitement about cleaner balance sheets was high at the start of the year, bringing the FTSEMIB to its highest level since 2008 in May, outperforming the broader European market. If we look at the markets today, however, it is hard to believe that the aforementioned strong performance took place this year. Currently, all major European equity indices are down significantly on a year to date basis, with the Italian Index ranking at the bottom. European banks are down by over 20%. Among the worst performing banking stocks, we find many Italian names, declining by more than 28%. So what has changed? A lot of the negative performance in European markets can be explained by external factors: the escalating trade war between the US and China, worries about the US economy being late cycle, and the era of cheap money slowly coming to an end are all weighing on investor sentiment this year. In addition to this, the EU also faces a significant domestic problem: Italy. Italy has the 3rd largest economy in the Eurozone. Government debt-to-GDP stands at around 130%, the second highest ratio after Greece, and the highest debt level in nominal terms. Economic growth has been subdued for decades, and nominal GDP is still lower than it was before the financial crisis. The mediocre performance of the Italian economy has had a negative impact on the asset quality of banking loans. In late 2015, non-performing loans (NPLs) accounted for almost 16% of total loans outstanding in the Italian banking system. After selling off parts of the bad loans, this ratio came down to c. 11% in 2017. NPLs affect banks earnings in a negative way, since they have to be provisioned for, showing up as an extra cost on the P&L (profit and loss) account. Further, once a loan cannot be fully recovered, its value has to be written down on the balance sheet. This reduces the assets of the bank, and thereby also lowers the bank`s equity. Due to the country`s high indebtedness and the high share of NPLs, investors became nervous when the newly elected government – consisting of a populist left-wing and a radical right-wing party – unveiled their budget proposal for the coming years. The targeted deficit was announced at 2.4%. By itself, this number does not seem too excessive. The problem lies in heavy spending: the government plans to lower taxes, lower the retirement age, and introduce a basic income to the poor and unemployed. The European Commission (EC) also believes that the Italian government judges GDP-growth too optimistically. Therefore, the deficit could end up higher than the projected 2.4%. In light of these doubts, the EC did not accept Italy`s budget proposal, and asked for a new budget – an unprecedented move in the EU. The government did not back down from its position, maintaining tension between the two parties. In theory, the EC could fine Italy by 0.2% of its GDP, should the country make no changes to its spending plans. This would equal more than 3 billion euros. From an investor point of view, the Italian dispute comes at a very bad time. Eurozone growth is still solid, but slowing compared to last year. Nervousness on markets is already elevated due to trade tensions between the world`s two biggest economies. Further, the ECB is gradually paving the way for monetary tightening: QE (Quantitative Easing, standing for the ECB buying government and corporate bonds) is expected to end this year, and the first rate hike is expected towards the end of next year. Italy has a high amount of debt to refinance, and monetary tightening will not make this exercise cheaper. 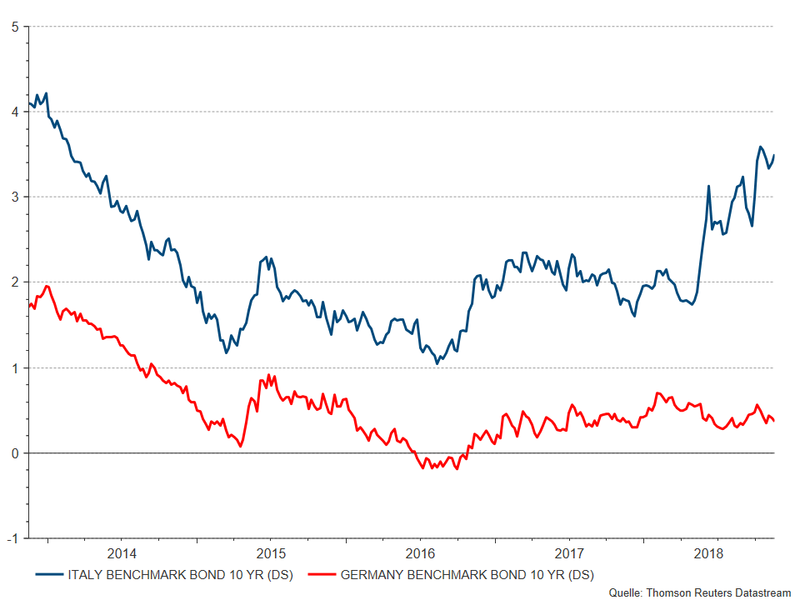 The spread between the 10 year yields of Italy and Germany – a measure of market fear – is hovering around 3%, the highest in more than 5 years. A level of 4% is said to be critical for both, the Italian state and their banks. The rise in Italian bond yields is also a negative for Italian Banks. Banks in Italy are large holders of Italian debt. An increase in yields results in lower bond prices, shrinking the bank`s assets and again, their equity. Going forward, the Italian situation will likely be the single most important factor determining the performance of banking shares in Europe. Fundamentally, the picture looks much better for banks than it did a couple of years ago. Capitalization of banks is stronger, asset quality has improved significantly and costs are held under control. Many banks returned to revenue growth in the last years through higher net interest income and higher fees. Also, the big regulatory changes seem to be over. Valuation of the sector is attractive, with a 30% discount to the broader European Market (based on price/earnings for 2019 of SX7P vs. SXXP) and a dividend yield of higher than 5%. For banking shares to outperform, however, investors have to be certain that the third largest Eurozone economy does neither plan to leave the Euro, nor will it run into a debt-crisis. Recent comments from the Italian government point to no quick solution. Positive triggers would come in the form of a lower budget deficit, or a change in government. The most likely scenario however seems to be a prolonged dispute between the EU and Italy, making the environment for European banking stocks a difficult one. “Black Monday” at the stock exchanges: Why?